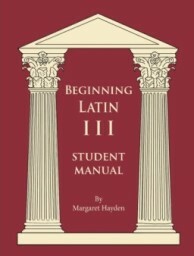 Beginning Latin III is made for younger students who have completed Beginning Latin II. It is designed so that it can be skipped, but it also provides challenging material with less analysis for the student who is not quite ready to begin Fundamentals I. Beginning Latin II is reviewed at a rapid pace in the first seven lessons. The principle new concept of Beginning Latin III is adjectives. Adjectives are very complicated and difficult to learn. The idea that all adjectives must agree with their nouns in case, number, and gender is not a rule in English. It is also difficult for the students to make the distinction between adjectives "agreeing" with their nouns and "matching" the endings of the nouns. By learning how adjectives work, the students solidify their understanding of nouns, grasp a difficult concept in Latin which will make their future work easier, and also begin to appreciate Latin as a unique language that often follows rules completely different from English. Beginning Latin III also introduces first and second declension nouns, predicate nominatives, and reflexive pronouns. Because the concepts being introduced are difficult, Beginning Latin III includes lots of review. The length of lessons is about the same as Beginning Latin II, but the exercises are harder. The process of translating also becomes more streamlined. The students still move in a step-by-step method, but instead of being given individual lines to write down every word of every step, they are given general boxes and lines to make notes and keep track of their own steps, and a final line to write the final answer. The method does not change, only the degree of aid. For more information, please see books.modg.org: Beginning Latin III.